Whenever Uruguay’s national team and their footballing philosophy are the topic of conversation, talk inevitably turns to the garra charrúa, the gritty determination and togetherness for which La Celeste is so well known. Since 2006, that garra has been a constantly evolving hallmark of Oscar Tabarez’s side. In the latest FIFA/Coca-Cola World Ranking they climbed one rung to sixth, just one short of their highest 2018 placing. With the 2019 Copa America coming up in Brazil on 14 June-7 July, what can the watching world expect of Los Charrúas as they continue their quest to return to the Ranking’s top three? FIFA.com picks out three key pointers. Uruguay will go into the competition full of confidence, having just retained the China Cup, thanks to emphatic 3-0 and 4-0 wins over Uzbekistan and Thailand respectively. The final of the competition also saw Diego Godin become the country’s most capped player of all time, with 126 appearances. There is much more to this Uruguay side than Godin, however. Fernando Muslera has kept goal at the last three FIFA World Cup™ competitions, while Luis Suarez’s Celeste career now spans 12 years, just one more than those of Edinson Cavani, Martin Caceres and Nicolas Lodeiro. 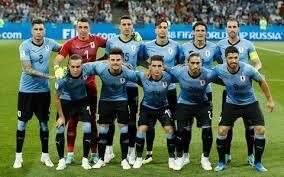 Uruguay can thus call on a hugely experienced core of players who are at the peak of their physical and mental powers and on hand to support the emergence of a new breed that is ready to take over from them. That generational handover is already under way, and the good news for Uruguay is that the players coming through have every intention of ensuring the outgoing legends are not missed too much. Front man Maxi Gomez, 22, has already scored his first goal for his country, while Penarol full-back Giovanni Gonzalez was in the China Cup squad and has made his debut in defence, an area where the Uruguayans are not exactly short of talent. In the lead-up to Russia 2018, Uruguay revealed a slight shift in tactics. While defensive organisation remains an integral part of their make-up, they are bedding in more technically gifted players in an effort to be more creative up front. Matias Vecino and Betancur are a prime example of that shift. Continually looking for and breaking into space, they can also serve up aerial balls to the front men. This impish creativity is just what the lethal strike force formed by Cavani and Suarez have been looking for. Having long functioned with a midfield concerned with cancelling out and pressing the opposition, Uruguay have spent the last year working on a fresh approach, one they hope to showcase to great effect at the Copa America. The question now is: how much success will it bring and will it lead them back to the top three of the FIFA/Coca-Cola World Ranking for the first time since 2012?